Day 316, deOccupy Honolulu: Although Honolulu took 49 days after Occupy Wall Street took Zuccotti park to set up their own encampment at the corner of Ward and Beretania, (de)Occupy Honolulu is the longest continuing encampment in the worldwide Occupy Movement. In the works is a short history and list of accomplishments (in the face of 42 raids by police and City crews) but for now I'm circulating the official schedule of events celebrating the first anniversary of Occupy Wall Street. Honolulu will be joining various Hawaii Occupy groups and the Occupy Movement worldwide to stop corporate GMO giant Monsanto. I'll be live streaming some of the events starting tonight. Follow me @HDoug at Twitter for broadcast notifications, or Ustream channel HonoluluDoug. And follow the Twitter hashtag #S17 for news before it's disappeared. Occupy Wall Street, the first of many public demonstrations that have now spanned into a world-wide grassroots movement, will be celebrating its first anniversary on September 17th, 2012. In solidarity with OWS’s calls to action, (de)Occupy Honolulu has plans for the upcoming days. On Sunday, September 16th from 3:00 pm to 10:00 pm activities kick-off with a celebration; Food Not Bombs and a live streaming party marking the anniversary of the Occupy movement by joining a countdown to midnight in time zones across the United States. Beginning Monday, September 17, at 10:00 am and continuing through the week, “Occupy UH Manoa-santo,” a public forum and encampment, will be formed on the sidewalk at University & Dole Street. 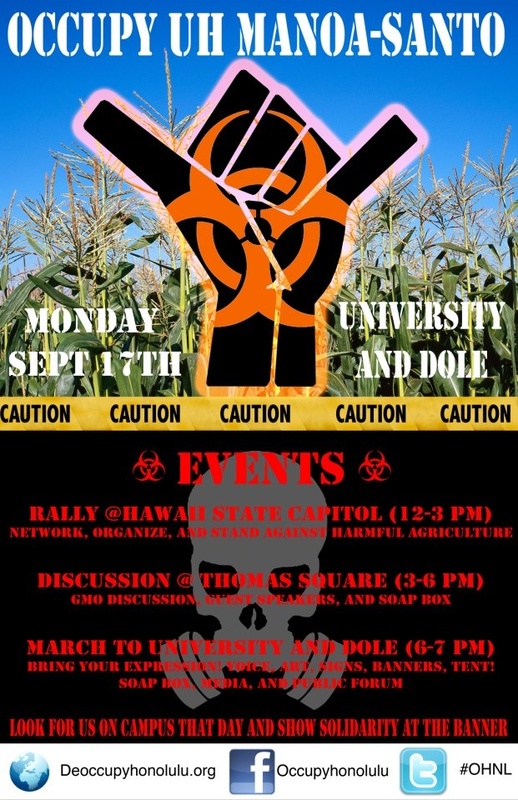 A rally will be held at the Hawai‘i State Capitol from 12:00 noon to 3:00 pm, followed by a discussion on Genetically Modified Organisms (GMOs) at Thomas Square from 3:00 pm to 6:00 pm, featuring guest speakers and soap box. At 6:00 pm, a march will commence from Thomas Square and end at University & Dole to join the encampment there. Documentaries, music, and other media will be shown at the UH encampment media center. "Monsanto's money has blinded the University to the downsides of GMO." tells Michael Broady Jr., "When you listen to the official story, biotechnology seems like a positive thing. It is supposed to help farmers grow more food, prevent loss of crops, while Monsanto is able to provide the University with funding. However, those first two claims have not been substantiated, instead leading 250,000 farmers in India to suicide due to the increased dependence on Monsanto which comes with patented GMO seed. I urge UH CTAHR to question the paradigm of monoculture, which is not profitable if all factors are considered including damages to the environment and human health." (de)Occupy Honolulu stands in solidarity with the larger Occupy movement and all those in occupied territory throughout the world. Organizers have kept a full presence at Thomas Square since November 5, 2011. It is the longest, sustained Occupy encampment in the world. Network, organize, and stand against harmful agriculture. GMO discussion, guest speakers, and soap box. Bring your expression! Voice, art, signs, banners, tent! Soap box, media, and public forum. Camp at U.H. on University and Dole all week long starting the night of the 17th.